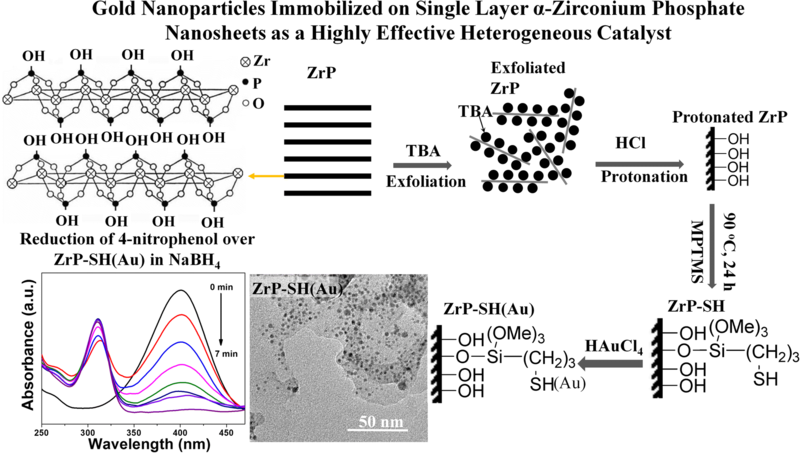 Gold nanoparticles (Au NPs) were immobilized on single-layered α-zirconium phosphate (ZrP) nanosheets as a highly efficient heterogeneous catalyst. The nanoparticles were characterized by thermogravimetric analysis (TGA), X-ray diffraction (XRD), X-ray photoelectric spectroscopy (XPS), UV–Vis spectroscopy, scanning electron microscopy (SEM), and transmission electron microscopy (TEM) techniques. The characterizations showed that the Au NPs with a size distribution of 2.0 ± 1.0 nm were uniformly dispersed and immobilized on single-layer ZrP nanosheets. The supported AuNPs could serve as an effective catalyst for the reduction of 4-nitrophenol by sodium borohydride (NaBH4). 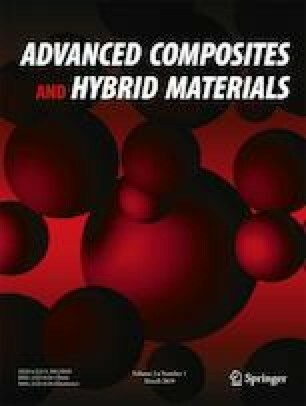 Metal nanoparticles (NPs) have been the subject of intense research in the field of materials science, primarily because of their unique physicochemical properties compared to those of their bulk counterparts. This has led to a wide variety of applications in catalysis [1, 2], biomedicine , sensors , optical components , and electronic devices . Noble metals, especially gold (Au) NPs, exhibit unique and tunable properties because of their surface plasmon resonance (SPR) absorption, large surface-to-volume ratio, and tunable shapes [7, 8]. These properties help improve their performance in multiple applications, especially as catalysts for many reactions , including CO oxidation, CO2 reduction [10, 11], cyclohexane oxidation  gas-phase oxidation of alcohols [13, 14], hydrogenation [15, 16], dye degradation , nitrophenol reduction [18, 19, 20], and C-C coupling reactions [21, 22, 23]. The efficient reduction of 4-nitrophenol (4-NP) to 4-aminophenol (4-AP) in the presence of borohydride (BH4−) has been intensively investigated as a model reaction over Au NPs. 4-NP is one of the most common organic pollutants in industrial and agricultural wastewater and is genotoxic and carcinogenic to humans and animals . The product 4-AP can be extensively used to produce photographic developer, corrosion inhibitor, anticorrosion-lubricant, and hair-dyeing agent . It is also a well-known compound used during the manufacturing of analgesic and antipyretic drugs. Therefore, catalytic reduction of 4-NP to 4-AP by Au NPs is an eco-friendly route to convert a pollutant to a valuable chemical. In general, the size of Au NPs plays a key role in determining their catalytic performance, and a smaller size usually leads to a higher catalytic activity [24, 26]. Unfortunately, Au NPs tend to aggregate into relatively large clusters due to their high surface area and surface energy, which is not favorable for catalytic applications. Immobilization of Au NPs on a support offers a potential solution to solve this issue. Up to now, various catalyst supports have been explored for the immobilization of Au NPs, including polymers [27, 28, 29], silica [30, 31], carbonaceous materials [25, 32, 33], and metal oxides . The nature (reducible or inert) and the surface functional groups (thiol, pyridyl groups, etc.) of the support appreciably affect the morphology and catalytic performance of the immobilized Au NPs [35, 36]. The inert catalyst supports, such as silica, will usually result in the agglomeration of Au NPs and thus a low catalytic performance [18, 35]. The reducible oxides, such as titania and ceria, may influence the electronic state of gold [36, 37]. Most polymers exhibit poor immobilization of Au NPs due to their weak interactions. However, well-designed polymer structures with specific functional groups such as thiol, amino, or pyridyl groups can effectively stabilize Au NPs and exhibit enhanced immobilization performance [38, 39]. Although well-designed polymer structures can effectively immobilize Au NPs, the immobilized Au NPs do not exhibit high catalytic performance. This is because once being immobilized, the Au NPs are typically entrapped in the polymer. Previous studies indicated that the choice of supports and surface functionalization are very critical in the immobilization of Au NPs . α-Zirconium phosphate (ZrP, Zr(HPO4)2•H2O) is a versatile layered compound, which has found a wide range of applications [41, 42, 43, 44, 45, 46, 47, 48, 49, 50, 51, 52, 53, 54, 55]. It can be easily exfoliated into single-layer nanosheets and used as a catalyst support [42, 56, 57, 58, 59]. The surface of ZrP nanosheets is covered by a high density (4.2 groups/nm2) of active hydroxyl groups [42, 60] and are easily accessible. This makes ZrP nanosheets an ideal candidate for post-grafting functional groups with a high loading density via various reactions. Moreover, such functionalized nanosheets can be uniformly dispersed in a wide range of solvents, meanwhile can be easily separated using centrifugation. On the other hand, the lateral dimensions of ZrP nanosheets can be easily altered by tuning the synthetic conditions [60, 61, 62, 63, 64, 65]. In this work, we aim to immobilize Au NPs on single-layer ZrP nanosheets as an efficient catalyst, which can be evaluated by the reduction of 4-NP with NaBH4 to produce 4-AP. The structure, morphology, and catalytic performance of the supported Au NPs will be discussed. Zirconyl chloride octahydrate (ZrOCl2·8H2O, 98%, Sigma-Aldrich), phosphoric acid (85%, Sigma-Aldrich), tetra-n-butylammonium hydroxide (TBA, Sigma-Aldrich), γ-propyl mercaptotrimethoxysilane (MPTMS, Sigma-Aldrich), hydrogentetrachloroaurate (III) trihydrate (HAuCl4·3H2O, 99.99%, Sigma-Aldrich), tetraoctylammonium bromide (C32H68BrN, VWR), 4-nitrophenol (4-NP, VWR), sodium borohydride (NaBH4, VWR) were used as received. Reagent-grade ethanol, hydrochloric acid (HCl, 37 wt.%), toluene, acetone, and acetonitrile were obtained from common commercial sources and used as received. ZrP micro-crystals were synthesized according to a previously described process . A sample of 6.0 g of ZrOCl2·8H2O mixed with 60.0 mL of 6.0 M H3PO4 was sealed in a Teflon-lined pressure vessel for 24 h at 200 °C. The prepared ZrP micro-crystals (0.10 g in 6.7 mL water) were exfoliated by TBA (3.3 mL of 0.10 M aqueous solution) in an ice bath with the assistance of ultrasonication, followed by a treatment of 3.3 mL of 0.10 M HCl to regenerate the protonated ZrP single-layer nanosheets [67, 68]. The thickness of one ZrP single-layer nanosheet is ca. 6.3 Å . A gelatinous precipitate of the ZrP nanosheets was collected by centrifugation and washed with water to eliminate chloride ions under vigorous stirring. The obtained ZrP nanosheet gel was then washed with acetone and centrifuged to exchange the solvent from water to acetone. This process was repeated three times to ensure most of the water was removed. Subsequently, the ZrP nanosheet gel in acetone solvent was treated by toluene to exchange solvents based on the same procedures and processes described above. This eventually led to the dispersion of ZrP nanosheets in toluene with the assistance of ultrasonication. Thiol groups were grafted onto the ZrP single-layer nanosheets according to a previously reported method . In general, 300 mL of ZrP nanosheets suspension (in toluene, containing 0.90 g of ZrP nanosheets) was mixed with 14.73 g (75 mmol) of MPTMS in a 500-mL flask and then refluxed and stirred for 24 h under N2 atmosphere. The obtained solid was rinsed with toluene three times, filtered, and vacuum dried. The product was labeled as ZrP-SH. 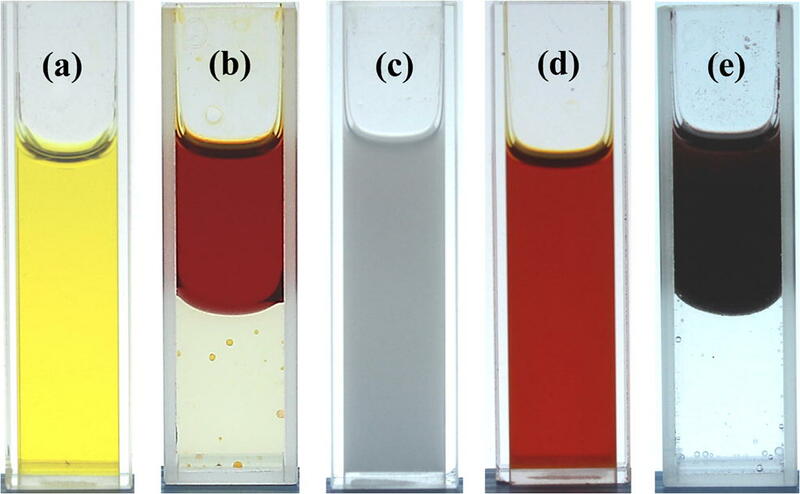 Gold nanoparticles (Au NPs) were synthesized in a two-phase liquid-liquid system . An aqueous solution of HAuCl4 (0.02 M, 50 mL) (Fig. 1a) was mixed with a solution of C32H68BrN in toluene (0.05 M, 100 mL). The two-phase mixture was vigorously stirred until virtually all of the tetrachloroaurate was transferred into the organic phase with a dark brown color (Fig. 1b). After that, the organic phase containing tetrachloroaurate was added to 0.90 g ZrP-SH dispersed in toluene (Fig. 1c) to form a uniform transparent brown liquid (Fig. 1d). An aqueous solution of NaBH4 (0.05 M, 100 mL) was then added drop-wise to the above solution and stirred vigorously for 3 h. The black organic phase (Fig. 1e) was then separated and evaporated to 10 mL in a rotary evaporator and mixed with 400 mL ethanol, followed by centrifugation to remove impurities. This separation, evaporation, and centrifugation process was repeated three times to obtain the final product ZrP-SH(Au). The thermal properties of the samples were characterized by a thermogravimetric analyzer (TGA, TA Instruments model Q50) under an air atmosphere (40 mL/min) at a heating rate of 10 °C/min. Prior to each experiment, the sample was isothermed at 100 °C for 30 min in an argon flow to remove absorbed moisture and then cooled to 50 °C to start the analysis. The X-ray diffraction (XRD) patterns were collected using a Bruker D8 diffractometer with Bragg-Brentano θ-2θ geometry (40 kV and 30 mA), equipped with a graphite monochromatic Cu Kα (λ = 0.1540 nm) radiation. The X-ray photoelectron spectra (XPS) were recorded on an ESCALAB250 (Thermo-VG Scientific, USA) spectrometer. A monochromatized Al Kα (1486.6 eV, 15 kV and 150 W) source was used for characterization. The spectra were recorded with a pass energy of 100 eV, and C 1s line (284.6 eV) was used as a reference to adjust the electrostatic charge. The ultraviolet-visible (UV–Vis) spectra were collected on a CARY 100 Bio UV–Vis spectrophotometer (Varian, USA). The specific surface area (SBET, m2/g) was estimated based on the N2 adsorption at the liquid nitrogen temperature on a NOVE 1000 Surface Area Analyzer (Quantachrome Instruments, USA). The samples were degassed at 150 °C for 2 h prior to each measurement. The surface morphology of the samples was recorded on an FEI Strata 400S field emission scanning electron microscopy (SEM). Transmission electron microscopy (TEM) images were observed on a JEOL 2010F (Japan) field emission TEM with an accelerating voltage of 200 kV. The samples were deposited on a copper grid and dried prior to imaging. ZrP-SH(Au) (1.0, 3.0, 5.0, and 7.0 mg) was added to an aqueous solution mixture of NaBH4 (0.50 M, 2.0 mL) and 4-NP (1.0 mM, 1.0 mL) in a quartz cell (1 cm path length). The cell was quickly placed in the cell holder of the UV–Vis spectrophotometer. The conversion of 4-NP to 4-AP was monitored by UV–Vis spectroscopy as a function of time. The time-dependent adsorption spectra of the reaction mixture with time intervals of 1 or 2 min in the range of 250–550 nm at room temperature were recorded. The rate constants of the reduction reaction were determined by measuring the change in absorbance at 400 nm as a function of time. As discussed in the introduction section, it is highly desirable to immobilize Au NPs on a solid support for many applications. ZrP single-layer nanosheets appear to be ideal supports for Au NPs as the immobilized Au NPs on ZrP can have advantages of both heterogeneous and homogeneous catalysts, because ZrP nanosheets can be well dispersed and exposed in many solvent systems but can be easily separated using centrifugation. Considering it is not feasible to directly immobilize Au NPs onto ZrP nanosheets, while thiol groups possess strong interactions with gold , we designed to first graft thiol groups onto ZrP nanosheets and subsequently immobilize Au NPs onto the thiol functionalized ZrP nanosheets. The overall process is illustrated in Fig. 2. The pristine ZrP displayed as hexagonal crystal discs with lateral dimensions of ca. 600–800 nm. After exfoliation, the ZrP single-layer nanosheets became smaller due to the fragmentation by the ultrasonication during the exfoliation treatment. After the functional groups were immobilized onto the nanosheets, both ZrP-SH and ZrP-SH(Au) clearly exhibit a porous structure, and the pore diameter of the latter is smaller. The specific surface area (SBET) of the pristine ZrP, ZrP-SH, and ZrP-SH(Au) determined using the Brunauer–Emmett–Teller (BET) method were 27.5, 129.2, and 119.0 m2/g, respectively. The SBET of the pristine ZrP was greatly enhanced after the surface functionalization, mainly due to the random stacking of thiol-grafted ZrP nanosheets with a porous structure. The coupling of thiol groups with Au led to the slight decrease in surface area, which might be owing to the blocking of some pores by Au NPs. To be noted, the SBET of ZrP-SH and ZrP-SH(Au) discussed above is that of the dried and restacked nanosheets. It does not represent their surface area in the dispersed state in a solvent, which should be much higher (but unfortunately hard to test). ZrP-SH and ZrP-SH(Au) nanosheets can be well dispersed in certain solvents (such as toluene, H2O, etc.) or reactants, enabling the functional groups to be highly accessible, which is critical for many applications, including catalysis. 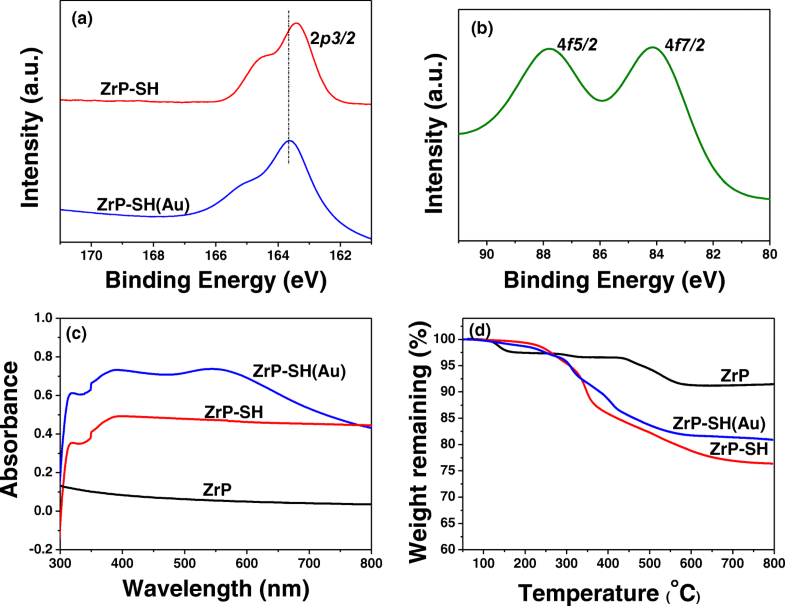 According to the XRD patterns of the pristine ZrP, ZrP-SH and ZrP-SH(Au) presented in Fig. 2, the ZrP micro-crystals possess a well-organized crystalline structure with an interlayer distance of 7.6 Å [42, 70]. When the functional groups were grafted onto the ZrP nanosheets, no diffraction peaks corresponding to a layered structure were observed in the XRD patterns of ZrP-SH and ZrP-SH(Au). This observation indicates that the grafting of functional groups onto ZrP nanosheets led to the random arrangement of the individual nanosheets due to the unfavorable restacking of the nanosheets with an irregular surface caused by the grafted side chains. After the thiol terminal groups were coupled with Au NPs, a new diffraction peak assigned to Au NPs located at ca. 38.3° appeared, corresponding to Au(111) plane (face-centered cubic, JCPDS 4-0783) . In addition, the other crystal planes (200), (220), and (311) were not observed, indicating that the Au NPs with tiny sizes were well dispersed on the ZrP nanosheets. 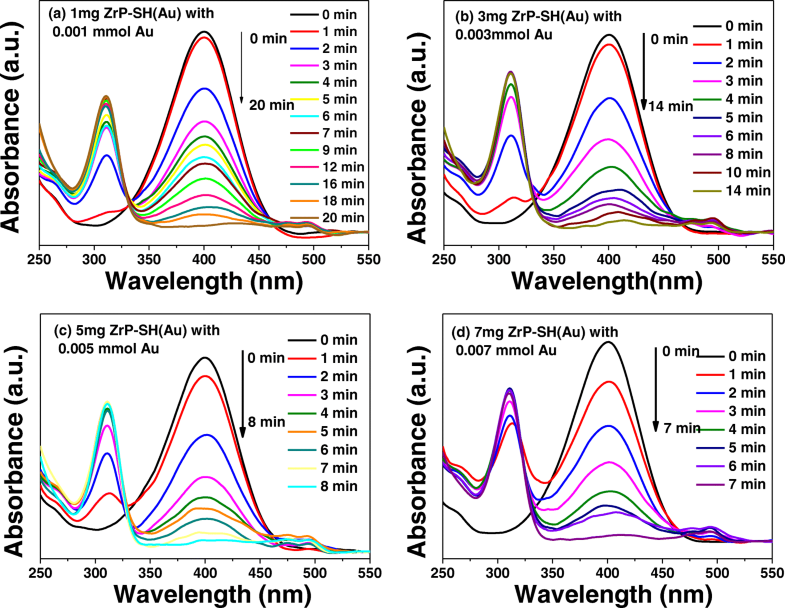 In order to further investigate the Au NPs immobilized on ZrP nanosheets, TEM characterization of ZrP-SH(Au) was conducted and the results are shown in Fig. 2. Overall, the Au NPs with a spherical shape were uniformly dispersed on the ZrP nanosheets and the size distribution of the Au NPs was 2.0 ± 1.0 nm. Few aggregations were observed. As displayed in the high-resolution TEM image of the Au NPs, the lattice planes exhibit no stacking faults or twins, indicating a single crystalline lattice structure inside the Au NPs. Moreover, the space fringes of the Au NPs were measured to be 0.22 nm, which is in accordance with the Au(111) planes . UV–Vis spectroscopy characterization was conducted to reveal the changes in chemical composition on ZrP nanosheets after surface modification with thiol groups and immobilization of Au NPs, and the results are displayed in Fig. 3c. There is no UV absorption for the pristine ZrP. After the surface modification by thiol groups, two absorption bands in the range of 300–340 and 350–450 nm are observed. ZrP-SH(Au) displayed similar but more intense absorption than ZrP-SH. Also, a new absorption band assigned to metallic Au  in the range of 480–600 nm appeared. 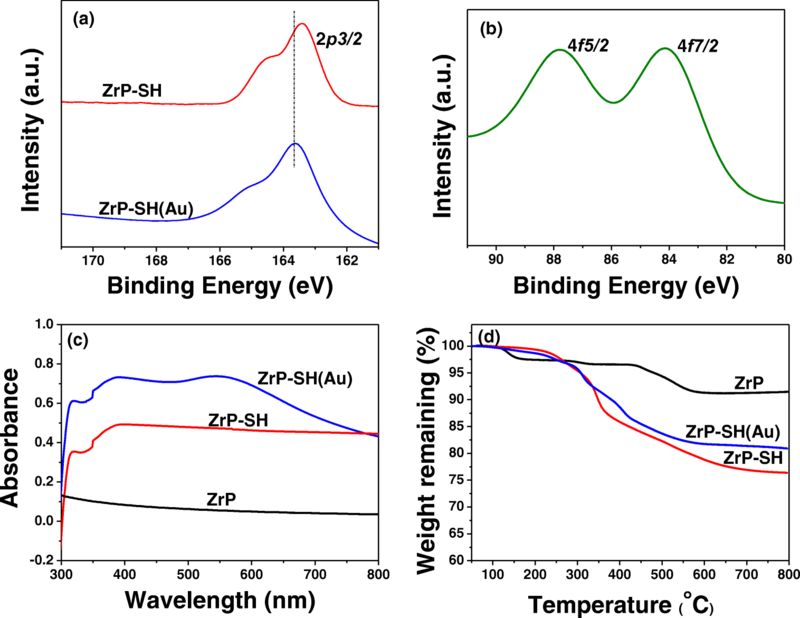 The enhanced UV absorption of ZrP-SH(Au) and the broad absorption band of Au can be attributed to the surface plasmon resonance (SPR) of Au NPs, which have been proven to be very sensitive to the size, shape, composition, and dielectric environment of Au NPs [72, 73]. Overall, the UV–Vis spectra further provide evidence of the attachment of Au NPs on ZrP nanosheets. The thermogravimetric analysis (TGA) results of the pristine ZrP and functionalized ZrP nanosheets are displayed in Fig. 3d. The pristine ZrP showed two major weight losses in the range of 100–170 °C and 420–600 °C, corresponding to the two-step loss of hydration water and condensation water in ZrP, respectively . 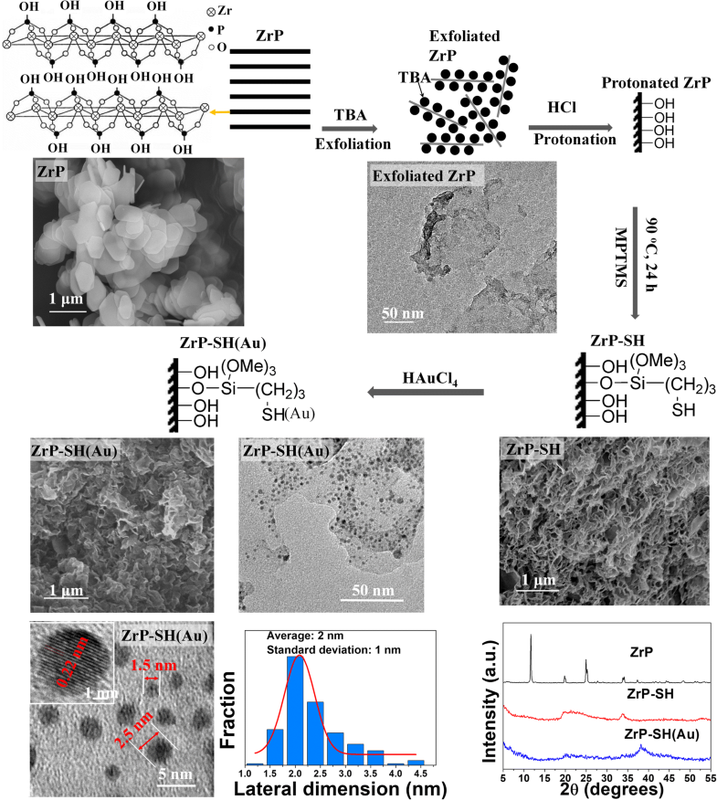 The thiol-functionalized ZrP underwent two degradation processes in the regions of 200–420 °C and 420–700 °C, which are ascribed to the step-by-step thermal decomposition of thiol groups and the remaining grafted organic segments on ZrP-SH, respectively. The entire weight loss was approximately 23.6 wt.%. ZrP-SH(Au) maintained a similar degradation trend as ZrP-SH, and the total weight loss was approximately 18.8 wt.%. Based on the TGA results, the degree of functionalization on the surface of ZrP nanosheets can be estimated. Because the distance of the neighboring hydroxyl groups on ZrP nanosheet surface (a minimum of 4.53 Å apart)  is twice as large as the bond length of Si-O in silane [57, 58]; thus, one MPTMS cannot bridge multiple hydroxyl groups. As such, based on the weight loss difference between ZrP and ZrP-SH, the degree of surface functionalization is estimated to be ca. 51%. The loading of Au NPs in ZrP-SH(Au) is estimated to be ca. 0.001 mol g−1, which is consistent with its feed rate during the preparation process. The catalytic activity of ZrP-SH(Au) was evaluated by a well-known catalytic reaction, the reduction of 4-nitrophenol (4-NP) to 4-aminophenol (4-AP) in the presence of NaBH4 . The catalytic process was monitored by UV–Vis spectroscopy, and the results are presented in Fig. 4a–d. The 4-NP with the UV absorbance at ca. 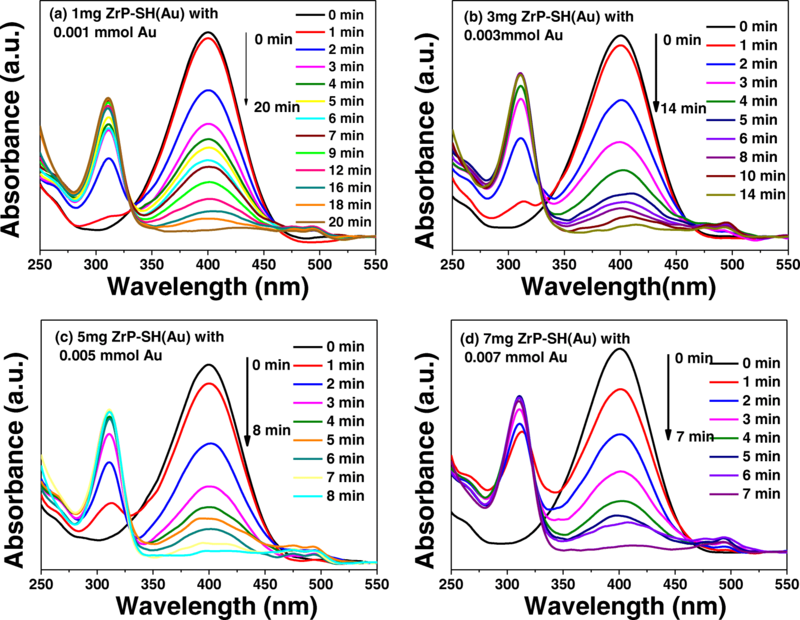 400 nm could not be reduced to the corresponding amino compound in the absence of a catalyst in an alkaline state caused by NaBH4, and it is clear that the prepared ZrP-SH(Au) can efficiently assist the reduction of 4-NP. With the addition of ZrP-SH(Au), a new absorption peak at ca. 310 nm was observed, corresponding to the formation of 4-AP. Once the reaction started, the characteristic UV absorption intensity of 4-NP rapidly decreased while that of the 4-AP gradually increased along time, suggesting a concentration increase of 4-AP. To be noted, the intensity of the 4-AP peak was not proportional to the decrease in 4-NP concentration, likely due to the difference in the molar extinction coefficient of 4-NP and 4-AP . Meanwhile, there was a tiny UV absorption centered at ca. 500 nm belonging to Au , which appeared as the reaction proceeded. This might be owing to the evolution of small hydrogen bubbles surrounding the catalyst particles, which helps “stir” the reaction system and thus should facilitate the dispersion of ZrP-SH(Au) in the reaction medium during the course of the reaction, which is favorable for the reduction reaction. In addition, this UV absorption wavelength (500 nm) is lower than that of the pure ZrP-SH(Au) (in the range of 480–600 nm centered at ca. 553 nm Fig. 3c). This is probably because of their difference in chemical surroundings. As we all know, the amount of catalyst used will significantly affect the progress of reaction. To investigate the effect of catalyst amount on the rate of reaction, different quantities of the prepared ZrP-SH(Au) were added into the reaction mixture. Samples of 1, 3, 5, and 7 mg of ZrP-SH(Au) (containing 0.001, 0.003, 0.005, and 0.007 mmol of Au NPs, respectively) were added to 4.0 mL of the reaction mixture. It should be noted that the catalyzed reaction follows pseudo-first-order reaction kinetics [30, 77], which means that the order of the reaction is one in proportion to the concentration of 4-NP. In the present study, pseudo-first-order kinetics was used to evaluate the reaction rate by correlating the natural logarithm of (Ct/C0) versus reaction time. Ct and C0, which are the concentrations of 4-NP at time t and 0, respectively, were measured from the relative intensity of the respective UV absorbance; thus, the rate constant K (min−1) can be estimated from the slope of the linearly fitted line. The result is shown in Fig. 5a, and the rate constant as a function of catalyst amount is summarized in Fig. 5b. The reduction time was observed to be 20 min for the conversion of 4-NP to 4-AP with 1 mg ZrP-SH(Au). With an increasing catalyst amount, the reaction was completed within a shorter period of time. The reduction of 4-NP exhibited a faster rate and the rate constant increased roughly linearly as an increasing amount of catalyst. The addition of 7 mg ZrP-SH(Au) led to the completion of the reduction reaction within 7 min, which is in good agreement with the results obtained for similar systems in the literature [29, 76, 78]. In order to compare our results with the literature data, the ratio of rate constant K over the total weight of the Au in ZrP-SH(Au) were calculated, k = K/m, where m is the mass of Au. The activity factor k of ZrP-SH(Au) at various catalyst amounts is listed in Table 1. The activity factor of ZrP-SH(Au) is much higher than that of the Au/graphene hydrogel (31.7 s−1 g−1) , spongy Au NPs (0.35 s−1·g−1) , and the polymer-supported Au NPs (2.26 s−1·g−1) . According to the TEM characterization of ZrP-SH(Au) (Fig. 2), the Au NPs were uniformly dispersed on ZrP single-layer nanosheets and possess a single crystalline lattice structure favorable for the reduction of 4-NP. Meanwhile, ZrP-SH(Au) could be well dispersed in the water-rich reaction system. The high degree of exposure of Au NPs enables their high accessibility to the reactants. The above facts are the reasons why ZrP-SH(Au) exhibits excellent catalytic activity in the reduction of 4-NP. As presented in Table 1, the activity factor decreased with an increasing catalyst amount, suggesting a decrease in catalytic efficiency as more and more catalyst is used, which is expected. The immobilization of Au NPs on ZrP single-layer nanosheets was achieved through a facile and practical approach. Au NPs were uniformly supported on the nanosheets. The resultant ZrP-SH(Au) catalyst can be well dispersed in liquid reaction system with a high degree of Au NP exposure. The prepared ZrP-SH(Au) was effectively employed as a catalyst in the reduction of 4-NP to 4-AP with NaBH4. In addition to catalysis, such unique features of ZrP-SH(Au) imbue the immobilized Au NPs with beneficial physicochemical properties in a broad range of potential applications including optics, electronic devices, and sensors. Financial support was from the ACS Petroleum Research Fund (Grant No. 57580-ND5) and the National Science Foundation (CMMI-1562907). Y.Z. received financial support from the Natural Science Foundation of Jiangsu Province for Youth (BK20160960) and the 14th Six Talents Peak Project of Jiangsu Province (XNYQC-016).